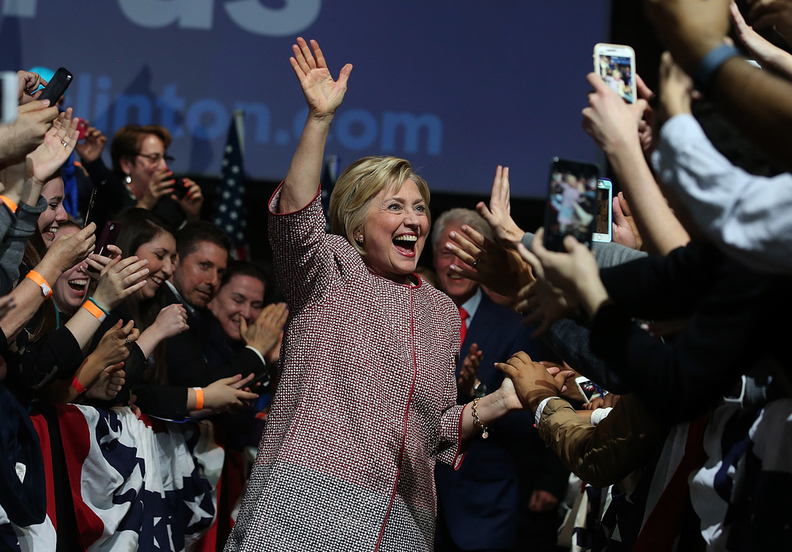 Clinton greets supporters in Manhattan April 19. With her solid victory over Vermont Sen. Bernie Sanders in the New York presidential primary Tuesday, Hillary Clinton took a big step toward clinching the Democratic Party nomination and taking her ambitious healthcare agenda into the November general election. But Sanders and many of his supporters continue to debunk her commitment to progressive healthcare and social change and belittle her claims of past achievements. They point to her failure in the mid-1990s as field marshal for the Clinton administration's healthcare reform effort to win passage of universal coverage legislation as proof of her ineffectiveness and timidity in confronting powerful special interest groups. “What Secretary Clinton is saying is that the United States should continue to be the only major country on earth that doesn't guarantee healthcare to all of our people,” Sanders said during a debate last month. Millennial voters, who have skewed heavily toward Sanders in the Democratic primaries and tend to scoff at Clinton's record, are too young to know her history. Even Baby Boomers are prone to forgetting it. It seems like a good time to revisit Hillary Clinton's healthcare story. Two people with first-hand knowledge of that story are Neera Tanden, CEO of the Center for American Progress, a liberal research and policy group based in Washington, and Fran Visco, executive director of the National Breast Cancer Coalition. Both say the Hillary Clinton they know is nothing like the self-serving politician described by her critics. Tanden—who served as a senior policy adviser to Clinton when she was first lady, legislative director when Clinton was in the Senate, and policy director when she ran for president in 2008—emphasizes Clinton's tireless work as first lady in helping pass and implement the State Children's Health Insurance Program, which now covers 8 million kids. It's widely acknowledged that Clinton played a pivotal role in building congressional and White House support for the 1997 passage of that legislation. She pushed her reluctant husband to support $24 billion in funding for the new program in the Senate bill, rather than the $16 billion approved by the House. "The children's health program wouldn't be in existence today if we didn't have Hillary pushing for it from the other end of Pennsylvania Avenue," Democratic Sen. Ted Kennedy, who co-authored the CHIP bill with Republican Sen. Orrin Hatch, told the Associated Press in 2007. Tanden's account of Clinton's CHIP implementation efforts squares with her sometimes-mocked image as a detail-oriented policy wonk. Hillary was the person in the Clinton administration most focused on outreach and enrollment for the new children's insurance program, bringing together private-sector officials from the Ad Council and AT&T to organize advertising and a toll-free line to get information out to the public, Tanden said. Even when she was running for Senate in 2000, Clinton still checked up regularly on the CHIP enrollment rate, just as she closely monitored the progress of the Affordable Care Act legislation—and lobbied Democratic lawmakers to support it—in 2009 when she was secretary of state, Tanden says. Clinton also was ahead of the curve on health information technology. In 2003, she introduced the Health Information for Quality Improvement Act, which called for a new office to create a national health information infrastructure including patient safety, privacy, and interoperability initiatives. The following year, the Bush administration established the Office of the National Coordinator for Health Information Technology. The breast cancer coalition's Visco recalls first meeting Clinton just before her husband was elected president in October 1992. She was struck by how much Clinton cared about the issue of breast cancer and how much she knew about policy relating to the disease. With the first lady's support, the coalition succeeded in persuading Congress to increase federal funding for breast cancer research from $100 million a year to more than $400 million, with some of that funding going to the Defense Department.